The diagram below shows the number of houses built per year in two cities, Derby and Nottingham, Between 2000 and 2009. 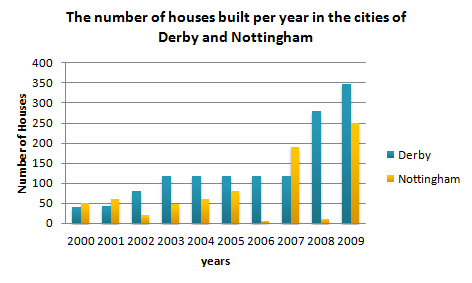 The bar chart describes the number of houses built in two neighboring cities, Derby and Nottingham, Between 2000 and 2009. Overall, the number of houses that were erected in Derby exceeded upwards the quantity constructed in Nottingham. The trend for the former was decidedly upwards, with Derby experiencing a steady rise from 40 new houses in the first year, to just under 120 during the 2003. Over the next 4 years of decade, new houses construction in Derby remained constant at just under 120. This is in sharp contrast to the last two years when the number of houses that went up in Derby leapt, first to 280 and then to 350 houses. Houses building in Nottingham, by comparison, was much more erratic. In the first two years of the decade, more houses were erected in Nottingham than in Derby. In 2002, however, construction declined to only 20. Over the next three years, houses numbers rose steadily, only to drop practically to zero in 2006. There was then a dramatic surge in 2007 with over 200 houses being built. While in 2008 saw house building in Nottingham plummeting to only 10, in 2009 the number of new houses rocketed to 270, a rise of more than 2600 % on the previous year.